How do I cancel or change my Skype subscription? Subscriptions must be canceled at least three days before your renewal date to avoid being charged for the next billing cycle. Sign in to your account and select Manage for the subscription you want to cancel. Select the radio button next to your reason for cancelling, and then select Cancel subscription to confirm your cancellation. When you cancel your subscription, it will continue to be active until the expiration date. 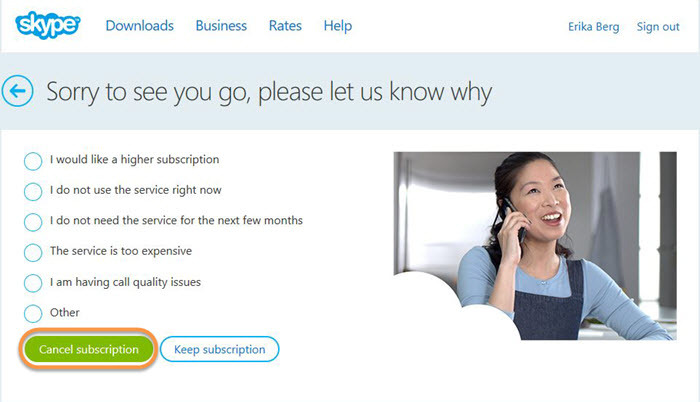 You can’t switch subscriptions or change your subscription to Skype Credit. However, you can cancel your subscription at any time and buy as many new subscriptions as you like. By subscription type – unlimited subscriptions are used first, then limited ones. By expiry date – subscriptions with the nearest expiry date are used first. Note: When you upgrade to a new subscription, the previous one will be cancelled and replaced with the new one once you've used all the minutes or the expiration date has passed. Can I get a refund for a Skype subscription or Skype Credit? 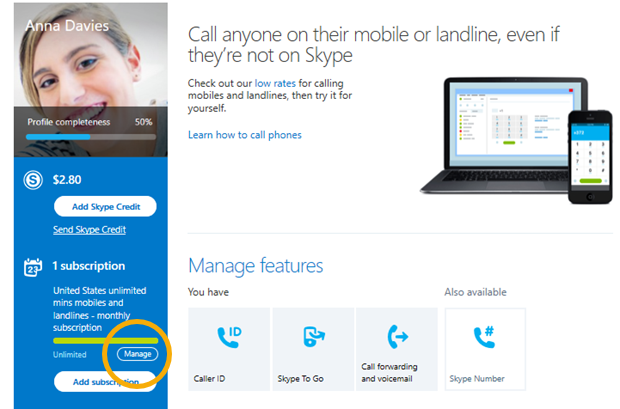 What are the different types of Skype subscriptions and pay-as-you-go options?